The SwiftPOS Gaming Interface software allows Venues to fully integrate their Poker Machine loyalty system with their Bars, Cafe’s and Restaurants so that Member’s can use their card anywhere in the venue and be rewarded for doing so, not just on the poker machines. This encourages Member’s to use all the facilities within the venue and not just one area. 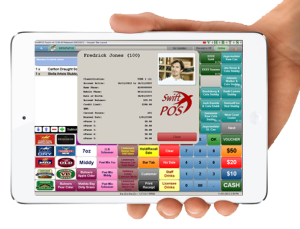 Member’s swipe their cards at the Point of Sale and the SwiftPOS Gaming Interface requests their details, tier and current points etc from the Gaming system and displays it at the POS Terminal. When the sales transaction has been completed it then adds the Points to the Member’s current points balance in the gaming system. The same process occurs for redemption of points up to the maximum available points that the Member has. SwiftPOS Gaming Interface can recall the players details via either swiping, entering their membership number or as simple as entering the poker machine number they are playing. The interface can also recall the players photograph for added security when redeeming points for products.